Come spend some time in a real, completely refurbished railroad caboose (with all the modern amenities) just off the Blue Ridge Parkway at Orchard Gap, approximate mile 193.5. Probably the most unique lodging along the Blue Ridge Parkway. Grassy Creek Cabooses are cabooses renovated into cabins for lodging/rental in the Blue Ridge mountains near Fancy Gap Virginia with private bath with shower, kitchenette, 2 person Jacuzzi's, 32” flat screen satellite TV (w/over 145 channels), heat and air in each unit. We are convenient to I-77 near the NC/VA state line or highways 52 & 58. We're family owned and operated (we live on site) open since 2001. Please tell your friends, family and coworkers about us. Relive a bygone era when train travel was fun and elegant. Come relax in a real caboose built by Nickel Plate Road or Norfolk Western and reminisce about the simpler times when everything wasn't so hectic and fast paced. Travel back in time and remember how you enjoyed waving to the brakeman in the caboose window when you were sitting at the tracks waiting for the end of the train to pass. Perhaps you'd prefer to stretch out in our large mountain cabin, we call it the Depot. It's similar in appearance to some of the old depots that once dotted the landscape at small railroad stops across the country. The 2 person jacuzzi is in the bedroom with a queen size bed and an additional queen size sleeper sofa is in the living area. The depot is very spacious with over 500 sq/ft (16'x32') and features 3 decks 2 of them covered as well as all the other amenities of the cabooses. There is also a 34' flat screen TV in the living area. You will not find a cabin this size with all the extras we provide for less. We have a few of the remaining mining cars from the old Austinville lead mines. There is only limestone left now but the mines used to produce the lead for musket balls, cannon balls and other things during the Revolutionary War and the Civil War. The lead was taken to the Shot Tower on the New River & molten lead was dropped down the tower into the river where it immediately cooled to form a round ball. The mines were opened in 1756 and were discovered by Colonel John Chiswell. The center car was an actual dynamite car but I had to rebuild it after it was out in the weather for around half a century. We are members of Virginia Green. They promote recycling, conservation, energy efficiency and other environmentally friendly projects. There are bins on the decks for recycling. We do conserve electricity so we need advance notification to make sure everything is turned on for your stay. Reservations are suggested but drop ins are also welcome, just have to cut things on. Recycling requires more work but we believe it is a good cause. We're also installing LED lighting outdoors to reduce power demands. Escape the hustle and bustle of urban life as you relax on one of the decks in an oversize rocker while taking in the high meadow, rolling countryside at an elevation around 3000 ft. There are a couple of oversize swings on the hill to relax and unwind while the world hurries by. Since we're just off the Blue Ridge Parkway you will find this to be a peaceful and serene setting. 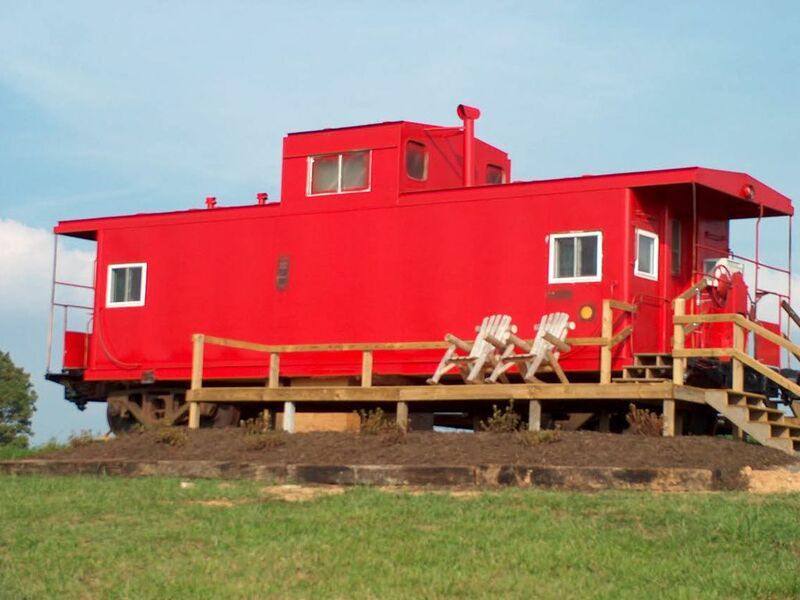 Grassy Creek Cabooses is a great place for your anniversary, honeymoon or a romantic getaway. You will find our accommodations to be secluded & private. We are biker friendly. On a clear night you can sit outside to see thousands of stars in the higher altitude without a bunch of those bright vapor lights. During the day you can walk around the 33+ acres and hike down the hill to Grassy Creek. There you can relax all by your lonesome among the pine & laurel thickets. On occasion you may see a doe & fawn run across or maybe even some turkeys or a buck. We have added some horseshoe pits for fun and relaxation. Whether you're just stopping over while traveling the Blue Ridge Parkway or as a home base for the many local activities you will find Grassy Creek Cabooses to be a most enjoyable and memorable place to spend some time. Mabry Mill the most photographed spot on the parkway is north about 18 miles. Located in the Blue Ridge Mountains just off the Blue Ridge Parkway between mileposts 193 & 194 at Orchard Gap. If traveling north on the parkway from hwy 52, turn left on Keno Rd at the Orchard Gap market and go 1.5 miles to Caboose Lane. If traveling south on the parkway from hwy 58 turn right on Keno rd at the Orchard Gap market. I 77 traveling south - take exit 8 and turn left under the bridge, go approximately 1 mile to highway 52. I 77 traveling north - take exit 8 and turn right, go approximately 1 mile to highway 52. After exiting from I 77 - At highway 52 turn right (south) and go about 1 mile to the Blue Ridge Parkway. Get on the Parkway and go (north) about 6 miles to Orchard gap, approximate mile 193.5. Turn left off of the Parkway onto Keno rd (the paved road) and go about 1.5 miles to Caboose Lane, turn right on Caboose Lane and proceed to the office. We bought the land around 1997 and built the entire business from the rails/ground up on our own. We started with 2 Nickel Plate Road bay window cabooses then a few years later we added the N&W cupola caboose for our third. We stripped down the interiors of the cabooses & refurbished them ourselves. Then we added the Depot a couple of years later to accommodate more guests. We're hoping to build something for the future for our children & granddaughter. She is already working on the business at 3 years old, if she is visiting she wants to help check folks in and insists on helping clean if we need to clean while she's here. Probably the best sunsets around. Love the rural high meadow setting with virtually no traffic. Quite possibly the most unique lodging along the Blue Ridge Parkway. Biker friendly, just off the Blue Ridge Parkway. Near several antique shops, Hillsville Flea Market, Floydfest, Galax, Mount Airy. We do not charge extra cleaning fees like some folks. Clean, comfortable, super easy check-in/check-out. Cute little caboose has everything you need to feel right at home. Cell signal was spotty so just know that at times you won't have any way to contact anybody - there are no house phones. But other than that, it was a great visit. The views are unbelievable. I just sat on the porch and had a cup of coffee for a very long time, so very peaceful and just what I needed. Yet close to whatever you're in the area for. Wonderful experience! We'll be back!! very unique and clean very friendly We will stay there again. Thank you for the review, we're glad you all enjoyed your stay with us. We have been on 16 trips over 71 days in the past 18 months. This is the second best spot. The best was in Cape Breton Island Nova Scotia. This is a bit closer to home, to say the least! Thanks for the review and ranking :). We're glad you all enjoyed your stay with us. My husband, myself and our 11 year Westie stayed here for one night November 18. Donnie and his wife are friendly and engaging. The caboose was the perfect size for us. Very comfortable and clean. The bed was the most relaxing sleep we have gotten in a long time. The view was amazing! Thank you for the nice review, we're glad you all enjoyed your stay with us. Fun little place to spend the night near the Blue Ridge Parkway. The Caboose was well-appointed with everything you would need for a night or two. We would definitely stay there again. Cozy get away that is fantastic for children. We thoroughly enjoyed our stay. The caboose "cabin" is just the right size for a couple and was perfectly fine for the addition of our two small grandsons who were thrilled to be staying in a caboose. It would be a great place to stay for a slightly longer visit in warmer weather.